From less than $3 per day you can be up and running in just minutes with dedicated support directly from the BaboonBones team !! We are Splunk Developers and Partners in the Technology Partner+ program. 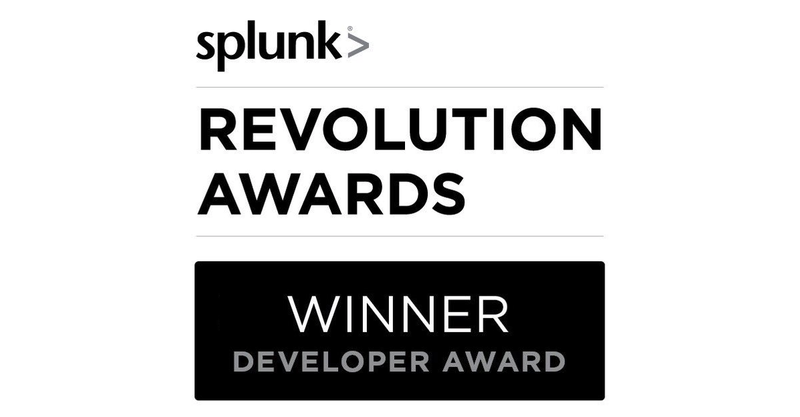 Winners of the 2018 Splunk Revolution Developer Award. The most downloaded and production installed developers in Splunk's history. 100,000+ App downloads, many of which are de facto standards. Thousands of supported production installations. Inventors of numerous other Splunk Apps, SDKs, Frameworks & Libraries. Founded by Splunk's former Worldwide Developer Evangelist & current Splunk Trust Inductee. The Ishango Bone is commonly recognized to be the oldest discovered artifact representing the storage, calculation and visualization of data. Damien Dallimore (founder) referred to this in a big data talk he gave in 2014 at QCON London, hence the name of this company. BaboonBones was set up to provide commercial support for all of our open source offerings and to offer custom Splunk development services. 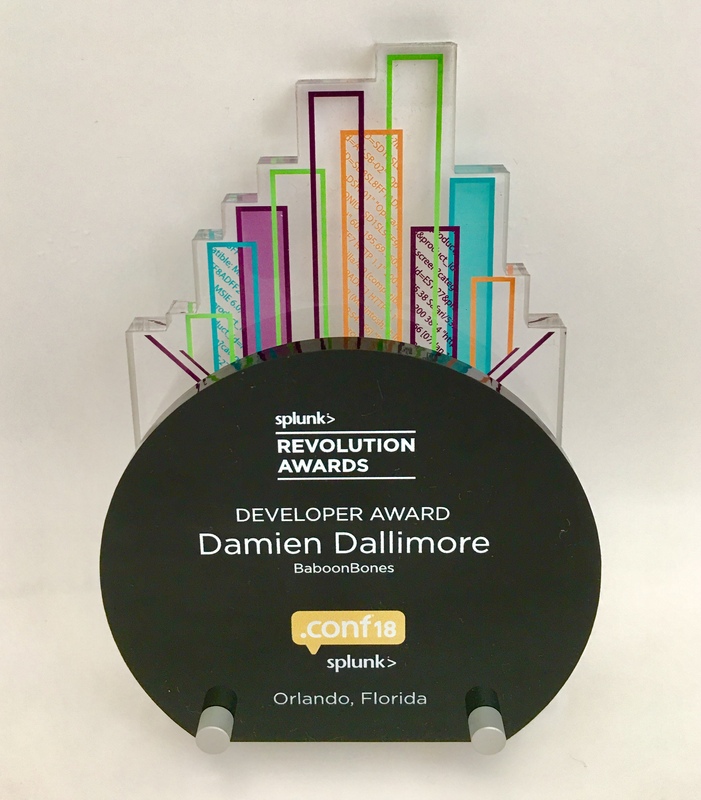 After the better part of a decade working at Splunk as Worldwide Developer Evangelist, Damien's accumulated body of work has been extensively downloaded and installed in Splunk customer production environments globally, in fact, he is the most downloaded and production installed individual developer in the history of Splunk and many of his creations have become de facto standards in their respective domains, spanning public and private sector customers and all verticals that Splunk touches.He has presented to Splunk developers on the global stage at all sizes of Splunk and Industry developer events and been a trailblazer for countless other Splunk Apps, Tools, SDKS, Frameworks and Developer Initiatives.Damien founded BaboonBones and personally oversees all of the team's development and support. As the most downloaded and production installed developers in Splunk history , our App development record speaks for itself. There are numerous ways to build upon and extend the Splunk platform to take your data experience to the next level. As we wrote about in a Splunk blog, it really is a Developer's Smorgasboard. We'll work with you to understand your data and objectives and determine what is the best App or Add-on solution that we can build for you. There is more to developing on Splunk than just Apps and Add-ons, you can build any custom solution that integrates with the power of the Splunk data platform and the SPL language.A common approach to this is by leveraging Splunk's REST API and SDKs.For example, look at this innovative integration of Alexa and Splunk we developed to deliver a natural language voice interface to your data in Splunk that has been showcased in mainstage keynotes at AWS re:Invent, Splunk Conf and talked about on CNBC's Mad Money. Consider the unlimited possibilities that a Splunk based solution can deliver for you. You can be up and running with dedicated support from the BaboonBones team in just minutes. These Support Plans cover all of the apps we wrote on Splunkbase. Support requests will only be answered via the channels in the below plans. By checking this you agree to adhere to our Community Guidelines. By checking this you agree to our Support Plan Terms And Conditions. All of our offerings are listed below to download and use as you wish.They are all open sourced on Github and available to download either on Splunkbase or directly from our website. You will need to register for a non-expiring activation key in order to use these apps. If you require support for any of the below Apps then please browse the support plans that we have available. "Monitoring of Java Virtual Machines with JMX" (formerly Splunk for JMX) can be used to poll local or remote JMX Management Servers running in Java Virtual Machines across your entire infrastructure and index MBean attributes, outputs from MBean operations and listen for MBean notifications. This is a Splunk modular input add-on for polling message queues and topics via the JMS interface. JMS is simply a messaging API and is a convenient means by which to write 1 modular input that can talk to several different underlying messaging providers : MQSeries(Websphere MQ), ActiveMQ, TibcoEMS, HornetQ, RabbitMQ, Native JMS, Weblogic JMS, Sonic MQ etc.. This is a Splunk Add-On for receiving data via a number of different data protocols such as TCP, TCP(s), HTTP(s) PUT/POST/File Upload, UDP, Websockets, SockJS. This is a Splunk App that enables your Splunk instance for interfacing with Amazon Alexa by way of a custom Alexa skill, thereby provisioning a Natural Language interface for Splunk. This is a Splunk Modular Input for executing commands and indexing the output. It is quite simply just a wrapper around whatever system commands/programs that you want to periodically execute and capture the output from ie: (top, ps, iostat, tshark, tcpdump etc...). It will work on all supported Splunk platforms. An instrumentation agent for tracing code level metrics via bytecode injection, JMX attributes/operations/notifications and decoded HPROF records and streaming these events directly into Splunk. Many apps we wrote were the original trail blazing innovations for getting data visibility into JVM environments and have been fundamental to driving Splunk's JVM data success, such as the JMX App, and they continue to be the standard bearers. We have also talked at multiple Splunk Conferences on the subject of Splunking the JVM. The very popular JMS Messaging App is the standard for getting your enterprise messaging data from the likes of MQ and Tibco into Splunk. It is being used very heavily in production uses cases with blue chip Splunk customers for large data volumes and message throughput per day. There are also several other apps for various messaging technologies and have talked about this subject at several Splunk Conferences. We know a thing or 2 about getting your IOT data into Splunk and many of our apps helped blaze the trail for Splunk's IOT success. We've also spoken on the global stage about getting your IOT data into Splunk and building IOT Apps. There is more to big data than just textual content and huge amounts of value exist in binary data if you have the means to process it into Splunk.Many of our Apps are designed with a pluggable pre-processor architecture so you can capture text and binary data and preprocess it into an optimum format for Splunk. In particular, our Protocol Data Inputs App is being used very successfully for this purpose by many customers. Our REST Modular Input has become the de facto standard for getting your HTTP and REST based data into Splunk. All API's are different and this App has been thoroughly battle tested in the field to get data into Splunk from numerous different API configurations.We have also provided many specific customizations of this app for customers and it has even formed the basis of many other successful Apps published on Splunkbase. We were hands on involved in the creation of Splunk's SDKs and created the Java logging libraries that subsequently blazed the trail for other Splunk logging libraries for developers. This is all subject matter that we have also presented and coded live on stage at several Splunk Conferences. We've also worked with numerous developers over the years to build Splunk Apps for the Devops ecosystem and gave one of Splunk's first ever Devops talks at an industry developer conference. Please browse the support plans that we have available. Please contact us so we can discuss your requirements and then present you with a quote and pricing details for our custom development services. All of our supported Apps require an activation key. You simply need to complete this form to receive your non-expiring activation key for the App that you wish to use. We also offer a 7 day trial key so you can evaluate the App before buying your non-expiring activation key. By checking this you agree to our Activation Key Terms And Conditions. We will automatically register you for Community Support.By checking this you agree to adhere to our Community Guidelines. We are here to work with you to maximise your success in using our Apps. Please browse the support plans that we have available.